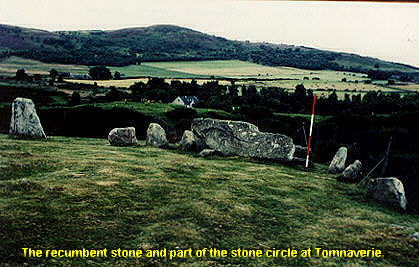 Tomnaverie - a description of the Tomnaverie recumbent stone circle and its astronomical significance. How to find : Travel north from the village of Aboyne on the B9094 for 6km. Look for a signpost on the left for the site, which is in state care. A walk uphill for about 200m brings you to the site. Best time of year to visit : Lunar minor standstill. This recumbent stone circle is set on a small hilltop, which has been partly quarried away. The recumbent stone and four of the stones of the circle remain standing in position, while the remainder have fallen. The kerbstones of an inner ring cairn also still survive. If ever a prehistoric site could speak and tell a visitor directly that its creators worshipped the sky and the bodies which move across the heavens, this must be it. The short climb hardly prepares you for the sense of space and openness which the site inspires, with wide views all around, and a sight of the distant Grampian mountains. The circle seems to elevate the visitor into the sky, to a place where the true scale and beauty of the country around can be appreciated. As is usual, the recumbent stone is set in the south-western arc. It has lost the flanker on the right, and the one on the left has fallen, but a visitor can still assess the area of horizon which the circle appears to focus upon. The azimuth range for the recumbent, viewing from the centre of the circle is from 230.0° to 241.8°. With the horizon values of 1.5° to 1.0°, this indicates a declination range of -23.1° to -14.3°. The sun sets over the mid part of the recumbent during the middle of November and again at the end of January each year. 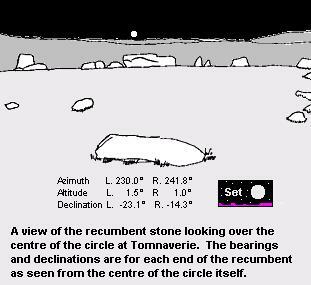 However, most of the recumbent stone circles seem to have been erected with respect to the moon, and the midsummer full moon at the minor standstill will set over the centre of the recumbent stone. Although not as well preserved as some other stone circles, this site should be visited at any time of year, if only to appreciate how well our ancestors could choose the places for their sacred sites.